MITI explains that the ASEAN-Australia-New Zealand regional deal covers goods, investment, environment and labour. It is the more ambitious of the regional agreements, as most just cover goods. To explain on RCEP, she notes that its aims to pool (disparate) rules. This and the Transpacific Partner (TPP) Agreement are open agreements as membership can expand as more countries can opt in. Malaysia is a small open economy and regards such networks as useful. Malaysia wants to be in room when new rules being made but it is another matter if Malaysia signs up. Two studies on TPP are done: I) one on national interest analysis and another ii) on impact on SMEs and Bumipura business. These two studies will be present to Parliament to make a decision. MITI reports that TPP will still take time to conclude its negotiations. MITI seeks a balance of benefits from the TPP Agreement. 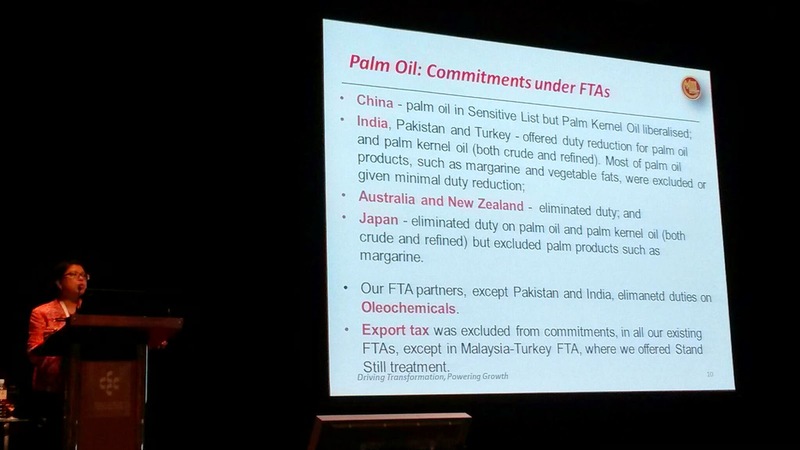 Once all 12 countries present their market impact commitments, then Malaysia can decide. MITI reiterates that it's important to shape outcome i.e. to be there when rules being formed. A short update on others deals: The (stalled) Malaysia EU deal has similar issues as the TPP, and there is also the European Free Trade Area deal in the pipeline. MITI talked about tariff rates facing palm oil, pointing India and Turkey rates as being rather higher potentially (the latter was hard to negotiate given the high rates scenario), and the relative impact on Malaysia and Indonesia if the import duties were to be raised. What is the potential impact on cost production impact versus trade gains? What is the impact on GLC plantations? What impacts from the labour and environment (sustainability) chapters?